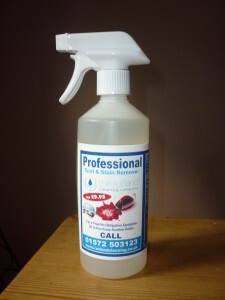 This is a bottle of Professional spot and stain remover that forms part of our spot and stain toolbox. It is capable of removing most naturally based stains including red wine, soft drinks tea and coffee. This normally retails for £9.95 and if you want and bottle then contact us. We are now giving away a bottle with every clean that we do.